We’d like to share dhtmlxGantt Roadmap with you. Here you’ll find our plans about new API, features, samples, tutorials and other things that we’re going to present in near future. The direction of future development of our Gantt component doesn’t completely depend on the ideas of our dev team. It’s important for us to get know what functionality you need, and where and how you’re going to use the component. 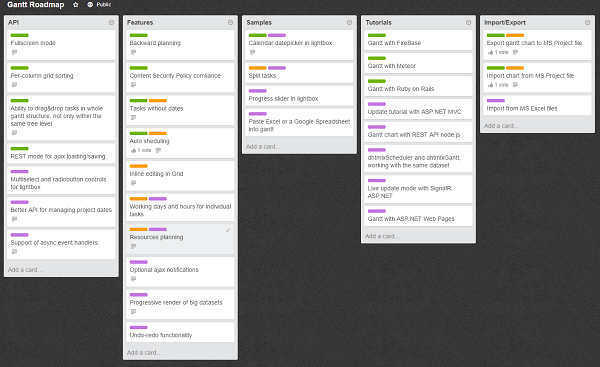 Many plans in this roadmap were taken from forum, support tickets, feedback after evaluation and other sources. And you’re also welcome to vote for the features you’d like to see first, tutorials and samples that would be most useful for you. As you can see, sharing your ideas is really worthy. Thank you for your opinion and for staying with us.